Piers Park, one of Boston's newest, offers dramatic views of the city skyline. Post Office Square: A lovely oasis in the heart of the city's Financial District that's a good example of public-private partnership. Piers Park is located on Marginal Street in East Boston, and was opened in 1995. It is owned and operated by the Massachusetts Port Authority. The program for the park required creating a children's playground, utilizing play structures, natural material and forms to complement the East Boston waterfront. The park was designed with significant participation from the community, and its success is in great measure due to the designer's sensitivity to the public outreach process. Suggestions from the community affected decisions ranging from the type of park furniture to the type and number of permitted activities. Two strategically located pavilions provide a place for people to observe the city skyline across the water. The park features a 600-foot pedestrian promenade that contains four smaller shade pavilions to provide parents places from which to supervise their children's play. 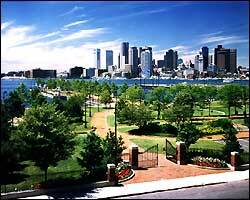 Piers Park totals 6.5 acres in area -- equal to five parcels of the Rose Kennedy Greenway. Pressley Associates was the landscape architect and designer. Piers Park answers, in part, the dense residential East Boston neighborhood's need for new public open space. The park reclaims a former pier and provides direct access to the waterfront, along with spectacular views of downtown Boston across Boston's inner harbor. Natural vegetation complements the landscaping of the park, including native salt-tolerant New England plants and more than 32 variety of trees, counter-pointed by seasonal flowers and ornamental shrubs. The promenade and the trails throughout the park were paved with a combination of granite and brick that can be identified as intermingling lines with the greenery from the distance. The materials used in the park are granite seawalls that have guarded the contour of the structure since 1870. Ane amphitheater that can host diverse public activities. Sailing center opened to the public, providing direct access to Boston Harbor. Outdoor fitness system designed as an exercise trail. Fencing to provide security and create an ambiance at night. Residents of surrounding neighborhoods must adopt a public parks if it is to be a success. This sense of ownership can be established early in the design process through public outreach and involvement that channels citizen concerns into concrete proposals. Parks must provide programmed activity and specific places for the events to happen. Security must be provided to create a safe environment for children to play.